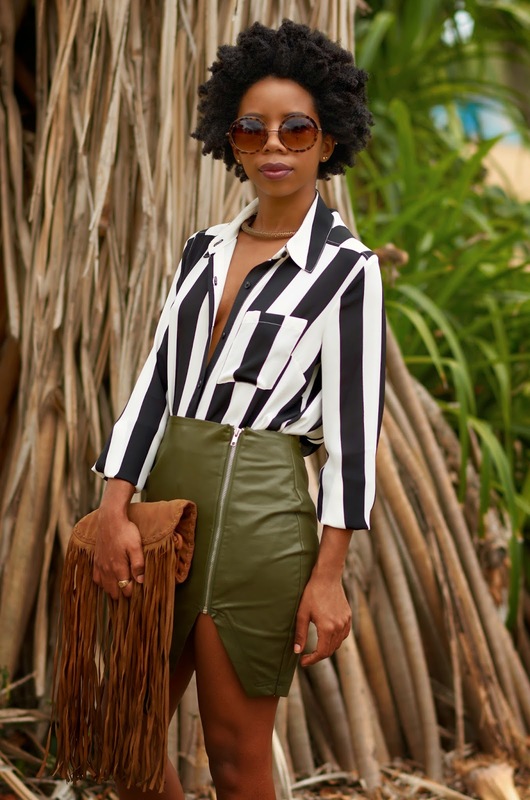 In case you missed it, the 70s is back baby and this S/S season has gone in full retro mode. Forecast shows signs of hipster wide-leg pants, groovy prints, funky suede and all sorts of good-vibes-boho-chicness. 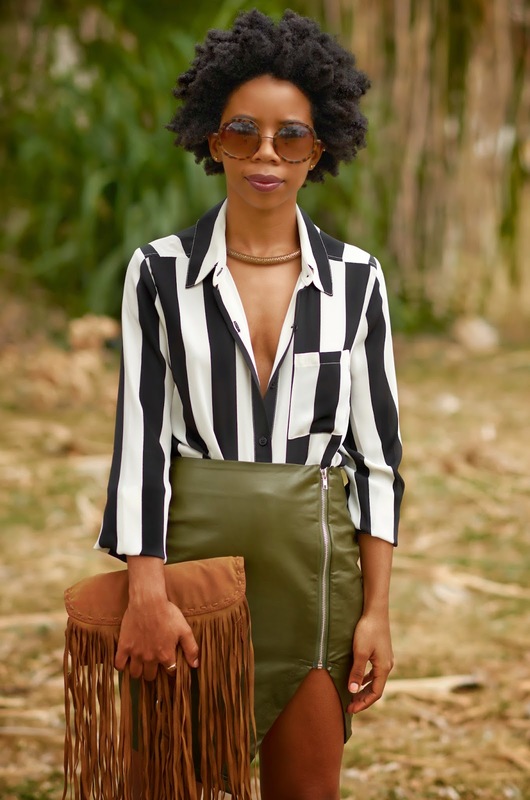 For a modern interpretation of the 70s I paired my bold stripe button-up with a khaki green structured skirt - added a little fringe flair and topped it off with a pair of foxy sunnies and spiffy sandals. This outfit was actually inspired by one of Alexander Wang's pre-fall looks that I tweaked a bit to make it more spring friendly. I really love it when I can piece together items I've had laying around to create a fresh new look. This shirt for example has been in my closet for atleast 3 years. NEVER WORN until this day. I bought this skirt online in October and when I received it I realized it along with all the other items I had purchased were ordered in the wrong size. I took it to the tailor but Im not too crazy about how it was altered so I will be taking it back for further adjustments -PETITE STRUGGLES!-. My shoes I actually just got in the mail and decided to take them for a spin and luckily I did not actually wear them out! You wouldnt believe the blisters I got on the back of my feet. My mom bought me padding for them so they will be more comfortable the next time I wear so hopefully I wont have to nurse any cuts after this. 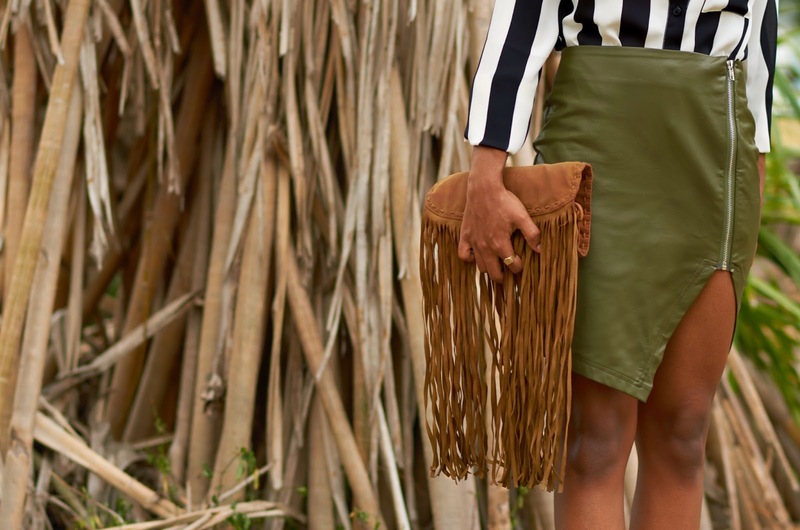 The fringe bag is actually a full length bag Ive owned for years, one of my favorites, that I folded to give a clutch vibe. I think I bought my sunnies from Urban Outfitters in 2009. Yes, OH-9 can you believe!? Ain't mad at this blast from the past trend but I'm curious as to what your thoughts are on the 70s flashback?! Are you feeling it? The shirt is giving me lifeee!!! love everything you are wearing! such a great look! I'm definitely feeling the 70's vibes right now and loving it! 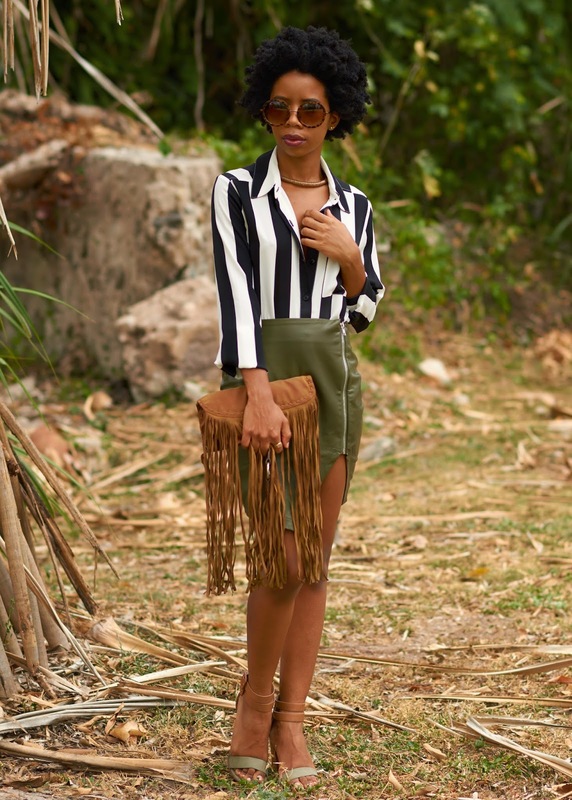 I love how you've revived some old pieces from your closet, such a fab look. I am so loving army green with black and white. It's so darn chic. Amazing look. I really love your whole look! great outfit! I don't know how I stumble upon your blog but I'm glad I did. Want everything you are wearing like right now.. Really love this look. I'm following you on Gfc, hope you can check out my blog too. Love your vibes. We really like your blog! Keep up the hard work! It's amazing!! ^.^ hahaha Thank yoooou! ^.^ I sure will!